SILICON SLOPES, Utah – February 27, 2019 – Domo (Nasdaq: DOMO) announced today it has been named to the Constellation ShortList™ for Cloud-Based Business Intelligence and Analytics Platforms for Q1 2019. 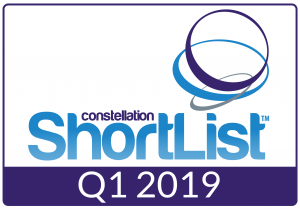 As one of six vendors included in this latest Constellation ShortList, Domo® offers the key requirements for early adopters pursuing digital transformation initiatives. With over 600 connectors and many ways to connect to your proprietary data, Domo connects all your systems—whether cloud or on-premises—to give you a holistic view of your entire organization. By bringing all the data into one place, the Domo platform helps companies gain the deep, contextual insights that allows business to center strategic discussions around real-time data and drive business. Constellation evaluated over 25 solutions categorized in the Cloud-based Business Intelligence and Analytics market. The chosen vendors were determined by client inquiries, partner conversations, customer references, vendor selection projects, market share and internal research. Rich collaboration features for authors, analysts and consumers. This is Domo’s seventh Constellation ShortList placement and the third time Domo has been named to the Cloud-based Business Intelligence and Analytics Solutions list, including Q1 and Q3 2018. For more information on Domo, visit https://www.domo.com.